Chasing is a behavior that goes back to the canine ancestor — the wolf — who had to hunt for a living. Many puppies still think chasing (people, cars, and especially cats) is a great pastime. However, your neighbors won’t appreciate a puppy who terrorizes their pets or threatens to run into the road. You can redirect the chasing habit and discourage your puppy from neighbors’ properties. Start inside. Place your puppy on a leash and go to an open room. 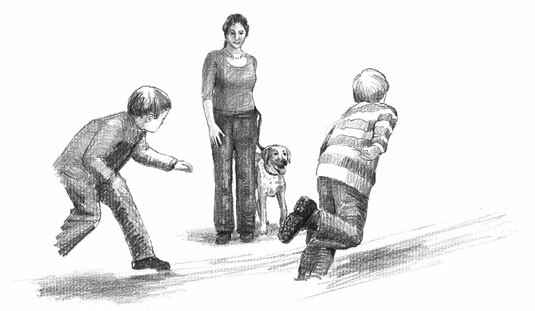 Ask the children to run in front of you while you hold the leash. The second you see that gleam in your pup’s eye, just as she prepares to bound after them, say “No” sternly and quickly tug back on the lead. After you’ve conquered the chasing exercise, you can try distance control. Using the long line or retractable leash, repeat the procedure but stand farther away from your puppy. Tell your little volunteers to race around in front of you (but no circling behind). Correct all thoughts of a chase by tugging back on the lead, saying “No,” and praising your pup for resisting temptation. Stage setups to curb your puppy’s impulse to chase. When a new puppy approaches a cat, one of two things happens: The cat runs, which leads to a free-for-all, or the cat stands its ground, often hissing or batting at the persistent pup. Regardless of the cat’s reaction, you want to steer clear of the interaction. But if you yell and chase a wild puppy, you only positively reinforce her chasing behavior. Walk your puppy on her leash and collar. Use a training collar if she’s old enough. If your puppy pulls or her ears perk in alert, tug the leash quickly and say, “No!” as you focus away from the distraction and lead your puppy away. Don’t stare and yell or let your puppy pull you toward the distraction; your puppy will perceive this behavior as backup and become more excited! To regain her focus, you may need to redirect your puppy with a treat cup or favorite toy, but keep moving beyond the distraction and wait until your puppy is focused on you to reward or play with her. Chasing cars is one scary problem. Young puppies are usually hesitant about cars until their fourth or fifth month. Around that time, fear turns to fascination and moving objects are best when chased. To nip this problem in the bud, you need to think a few steps ahead of your dog. Instruct your dog with the command “To the side” and move either to the side of the road if you’re walking along a street or to your front door if you’re out in your yard. Encourage your puppy to look to you by shaking a treat cup or offering food or a toy. If she lunges at the car, say, “No!” very sternly and bring her back to your side. Use rewards and/or a clicker to encourage your puppy to focus more on you than the car. Use this same technique with bikers and joggers. Correct your dog the second she thinks about chasing something. After she’s in motion, you’re too late.